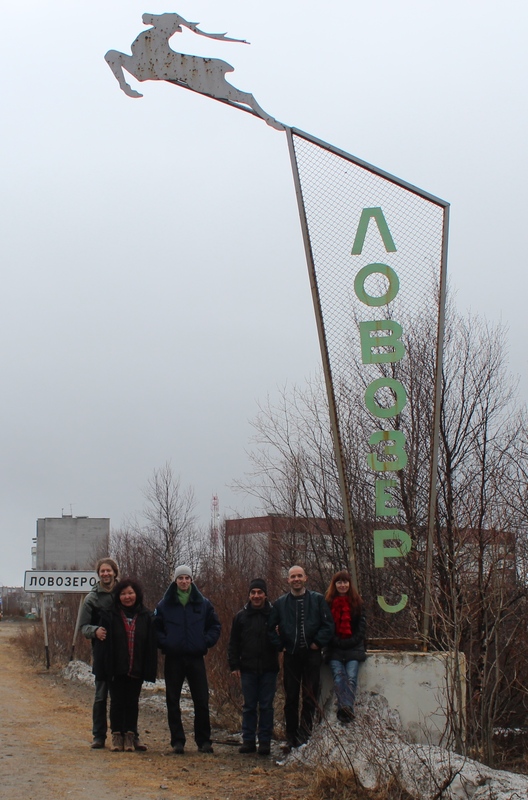 Last weekend our almost complete research team of the ORHELIA project (only Roza was unfortunately missing) went to Lovozero, the Sami ‘capital’ of Russian Lapland. It was probably my shortest field trip ever, with only one full day at our disposal and almost two entire days spent in a car. The main goal this time was not to gather as much information as possible but, on the opposite, to spread ORHELIA’s voice. It is the goal of our project to have such meetings in all our field sites. We already had one before in Sevettijärvi (Finland) and our next one will be in December in Naryan-Mar. The ORHELIA team just arrived to Lovozero. Lovozero from its nice side. 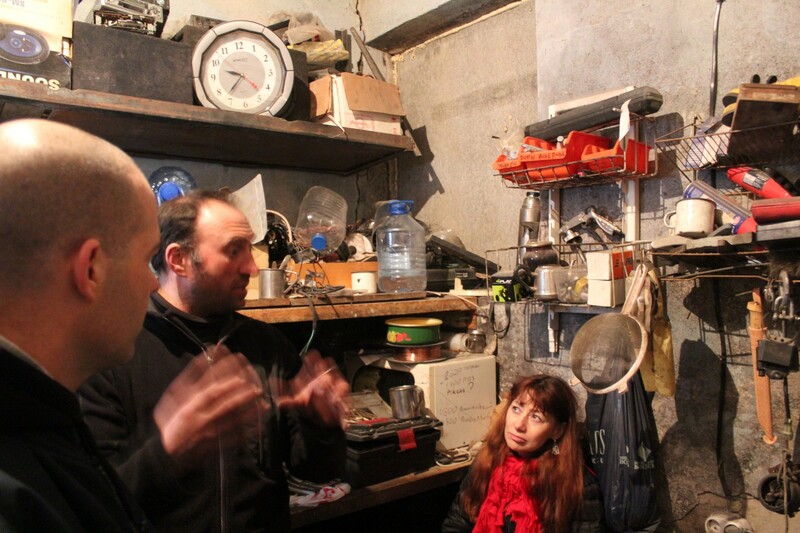 In Lovozero we organised an info meeting with local people from Lovozero, aiming to let them know about the goals of our project and what benefit it might bring to them as the beneficiary owners of the “raw material” we are working with. This meeting took place in the “Chum”, which is officially called “National Culture Centre” – with ‘national’ meaning ‘indigenous’, the latter being banned from official soviet terminology. 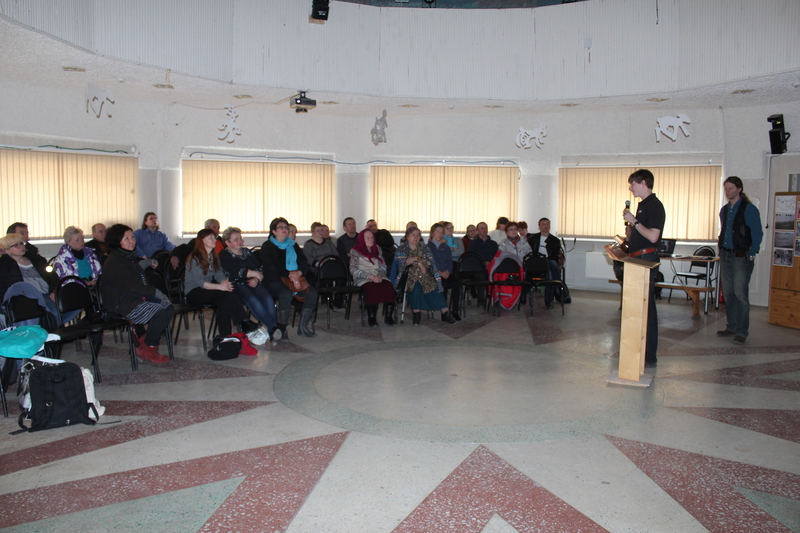 Thanks to the organisational support of Valia Sovkina we could manage to gather quite a bit of people. 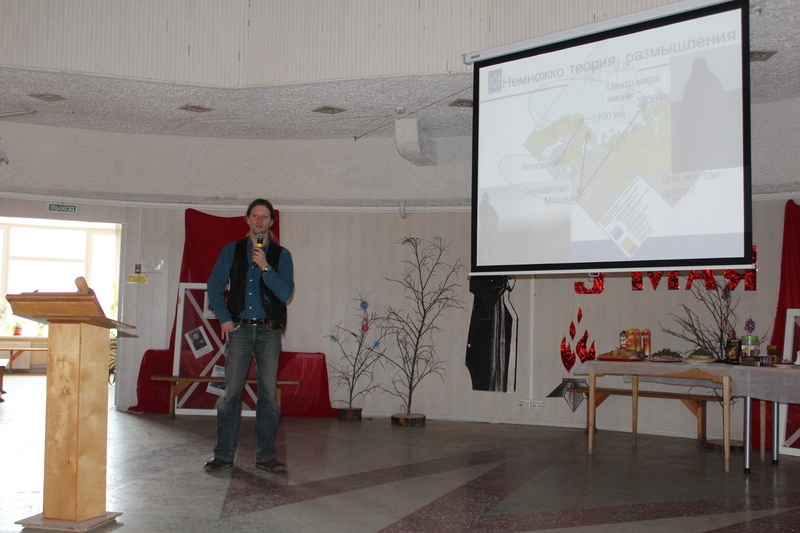 Holding our presentation in the “National Culture Centre”. In the first part of the meeting everybody shortly told about their field site. Our accounts were overarched by Florian’s presentation in which he outlined our comparative approach and the centre-periphery concept: Decisions about the Northern ‘peripheries’ are taken far away in administrative and political centres like Moscow or Helsinki. But is it so evident what is the periphery and what the centre? Doesn’t it depend on where one lives? Aren’t capital cities all too often little-knowing peripheries sending decisions to people’s lifestyle nuclei? Florian talking about centre-periphery perceptions. 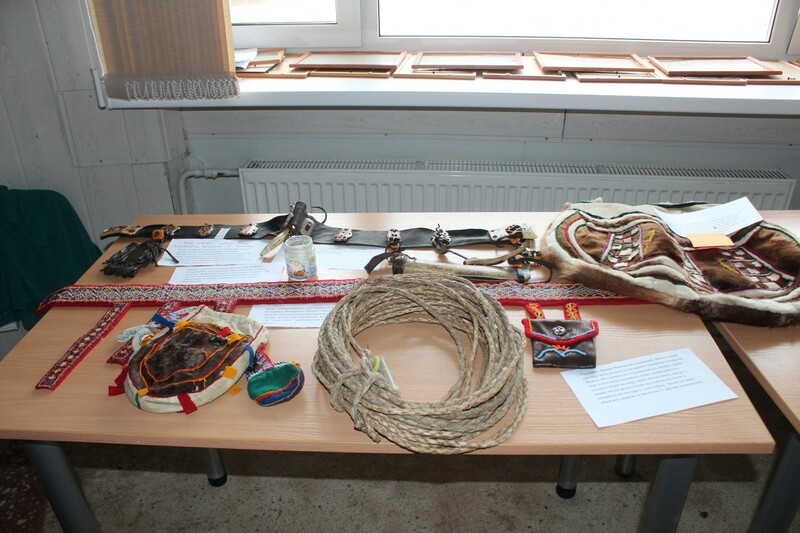 The meeting was visually accompanied by slideshows and an exhibition of items from our different field sites. These visuals stimulated our discussions with many interested locals while having tea after the presentations. 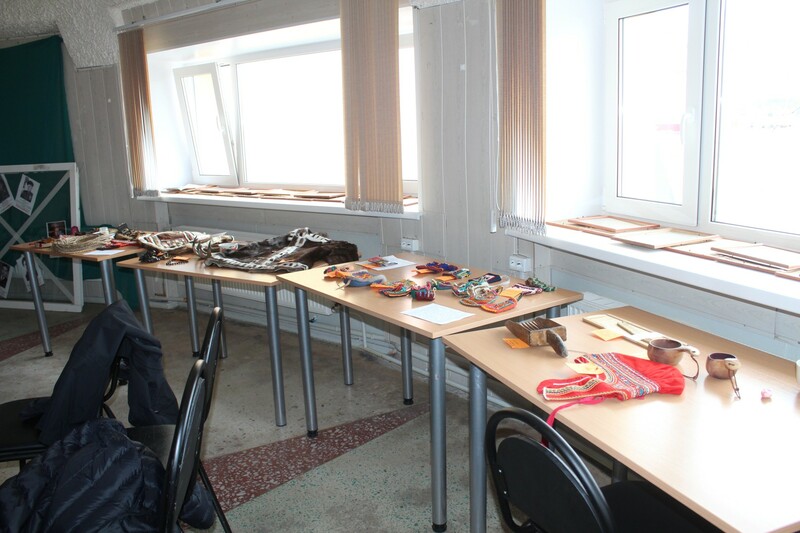 The exhibition contained items from the Kola Peninsula, Yamal, Arkhangel’sk Region, Sakha and Finland. In the centre we see a reindeer herder’s lasso. 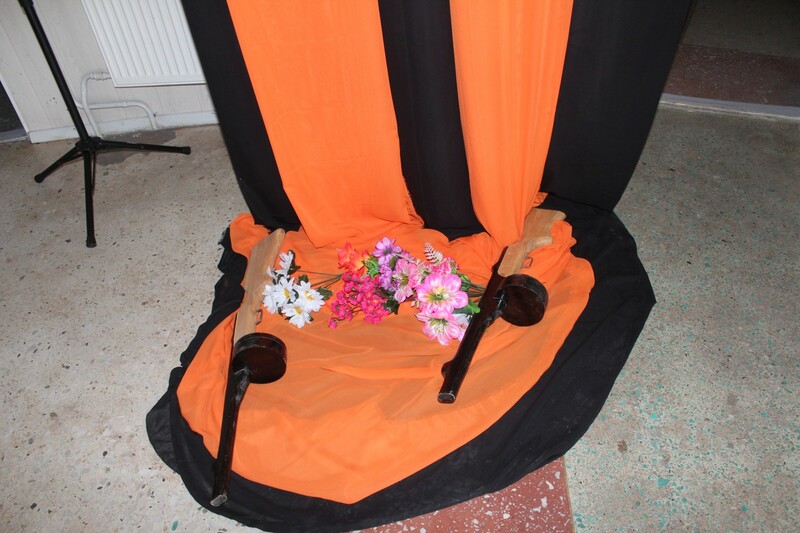 Our exhibition was sided by mock-up guns n’ roses on the orange-black background of the St. George’s Ribbon, a widespread symbol of commemoration of World War II, the end of which was celebrated in Russia on 9th of May. 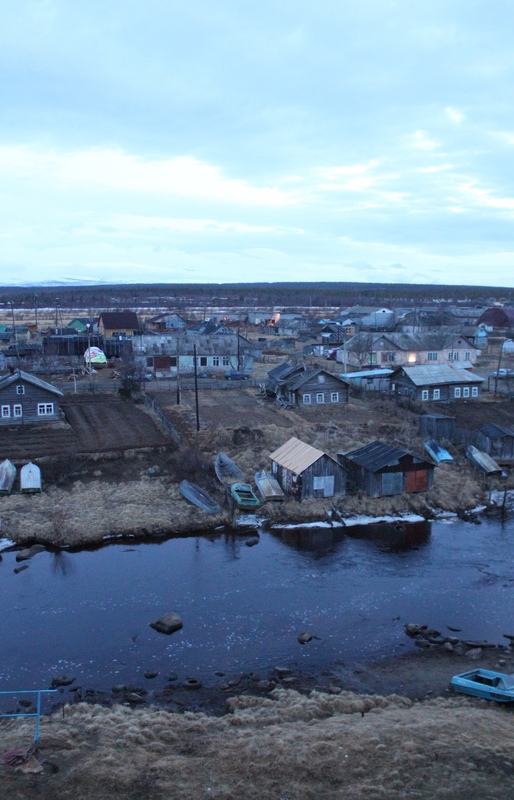 For me, who is working with Russian Sami people, having my colleagues from the other field sites here in Lovozero was an important door-opener for my further work. Letting people know who we are and what we are doing creates trust and a feeling of shared interests. I have no doubt that this will reflect in future interviews. 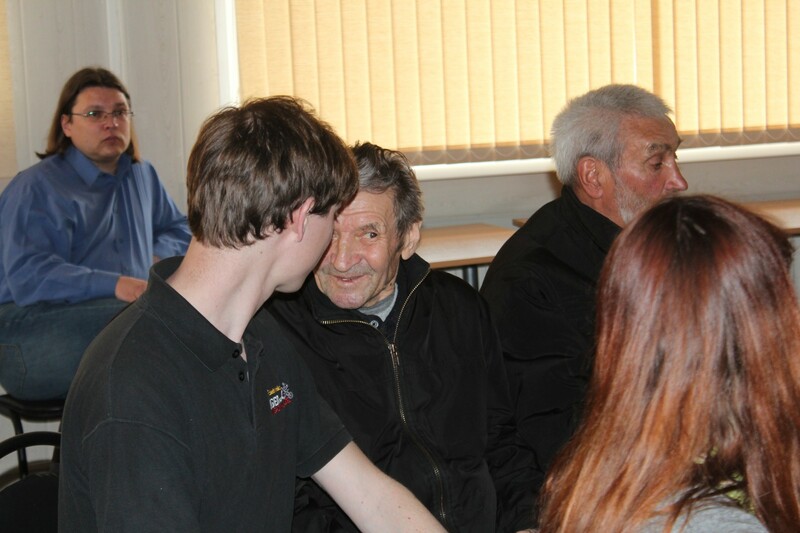 In the aftermath of the meeting several people expressed the wish to meet and share their stories with us. 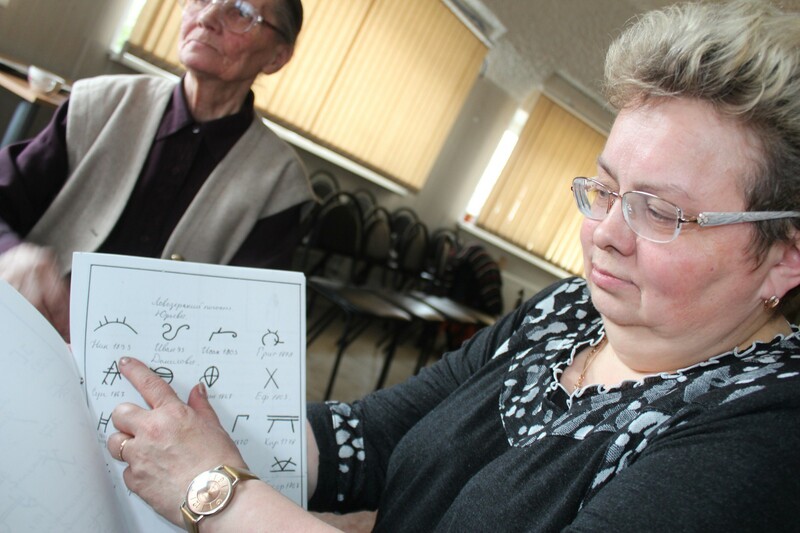 Larisa Pavlovna Avdeeva showing old signatures used by Sami families in official documents before literacy became widespread. Meeting again with Evdokim Alekseevich Galkin. Anastasiia Eliseevna Mozolevskaia shows her private archive containing materials even from pre-revolutionary times. Without any doubt, our most popular team member in Lovozero became Nuccio. While we all could communicate in Russian, Nuccio had a most unexpected common language ready for use: North Sami. A Sicilian in Russia who speaks North Sami with the locals. What an exceptional combination! 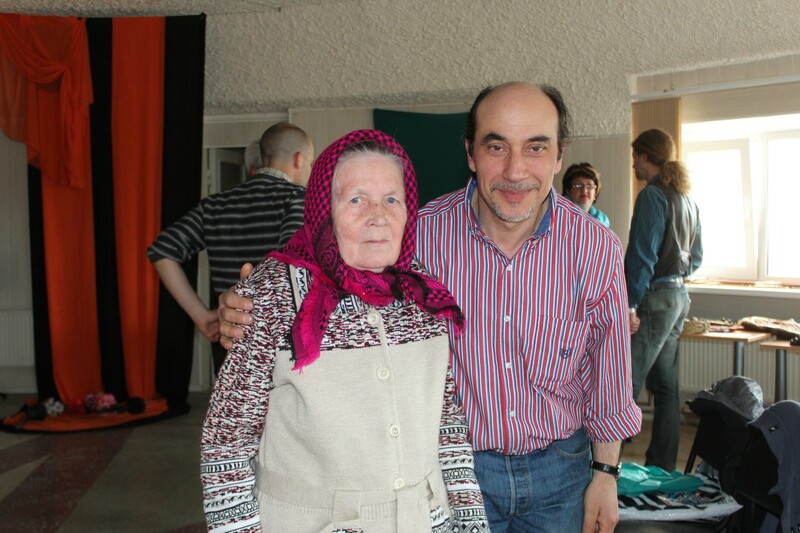 Nuccio together with Mariia Alekseevna Popova who originates from the siida Voron’e, which has been flooded due to a dam construction in 1967. While Nuccio speaking Sami enchanted our audience, there is another remarkable fact making possible this unexpected way of communicating: North Sami, a language originally not used in Eastern Sapmi, in the past twenty years has become the second most spoken Sami dialect there, behind Kil’din Sami, but with much more speakers than the other dialects of Eastern Sapmi (see Scheller 2013, 409 f.) due to intense cooperation programmes especially with Norway. This example has shown in a nice way that North Sami has become a lingua franca in transnational Sami contacts. 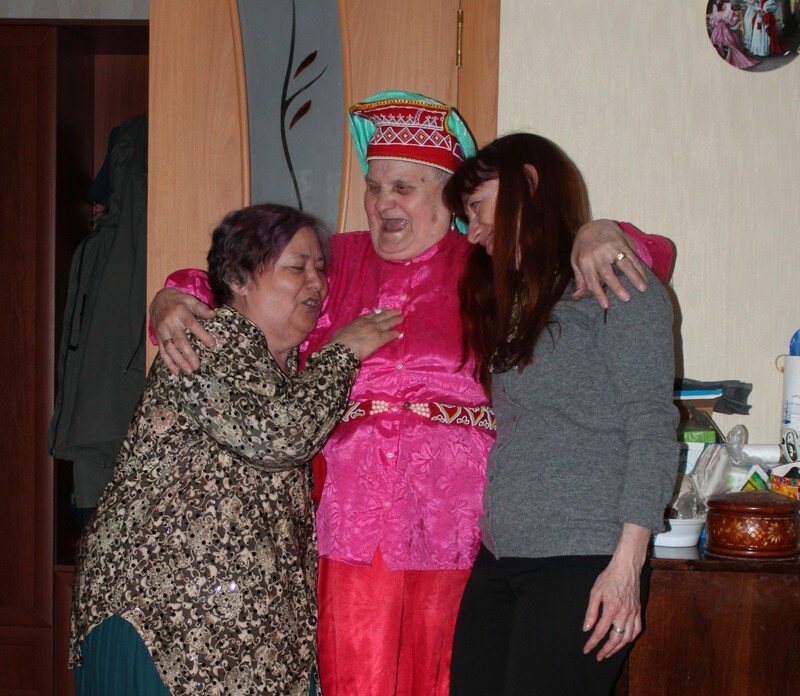 Ekaterina Nikolaevna Korkina (left) took us to a spontaneous visit to her best friend Anna Efimovna Novokhat’ko. 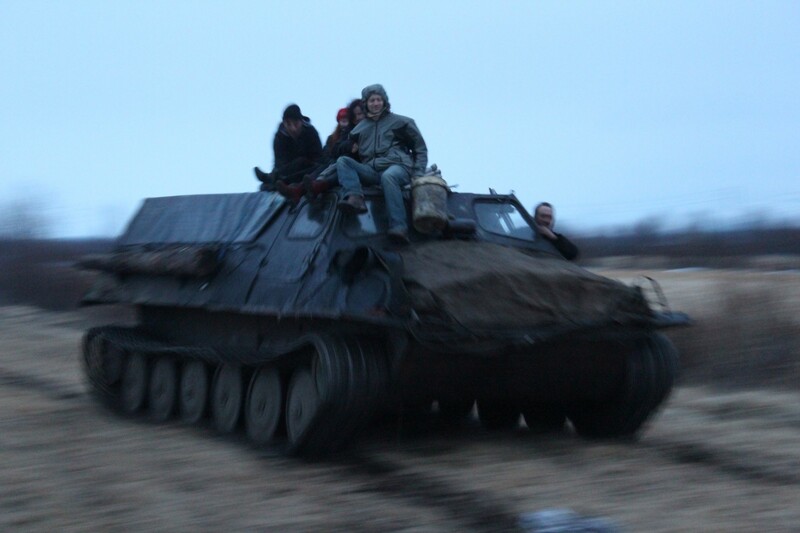 Having some fun with Yuri Drozdovskii, a vezdekhodchik (‘all-terrain-vehicle-man’) who regularly supplies reindeer brigades and villages without road connection. Generally speaking, everybody of our team was overwhelmed by the openness and the interest of the attending people, regardless to the fact that Lovozero can be designated without any doubt as ‘over-researched’ in the past twenty years. We take this as a very encouraging feedback on our project. Thank you, Lovozerians! This entry was posted in All, Fieldwork, Indigenous Peoples, oral history, Russian North, Sámi and tagged Lovozero, outreach. Bookmark the permalink. This is so fascinating! 🙂 You are doing the work that I would love to be doing, however, I must add some education in first (holding a HND Graphic Design + abandoned 25cr from Ethnology and Cultural Ethnology, hopeful studying Bachelor of Northern Studies next year). 🙂 Do you please know about any resource where I could look in more detail at the Sami signatures used before literacy? It’s an absolutely remarkable example of the crossing of visual culture/graphic design and ethnology for me and I’d love to know more – and then write about it on my Slovak blog about nordic visual culture and design, with sprinkling of ethnology. 🙂 Thanks a lot! Dear Michaela, it’s very rewarding to read comments of people who are somewhere on this planet and share the same interests and enthusiasm. I therefore apologise I let you wait so long for an answer. I’m not at all an expert in pre-literacy issues, but I would suggest that there are generally three things which you should look into: rock paintings, paintings on shaman drums and other items, and reindeer earmarks, which were also sometimes used as a signature when interacting with tax authorities and other state institutions. I could scan something for you about earmark signs used in Russian Lapland. Do you also read literature in Russian? Please write me an email to lukas.allemann@ulapland.fi, and I will send you the scan. By the way, you could post here a link to your Slovak blog about nordic visual culture and design, I would be interested to have a look!